Let’s take a closer look at common Doberman Pinscher traits and behaviors. Keep in mind that not all Doberman Pinschers will display the same characteristics. Initially, the Doberman was bred to be aggressive; after all, they were needed to defend their master. Another important part of the dog’s temperament was trainability, so they only attacked when commanded to do so. These characteristics were ideal for a protection dog, but are totally unsuitable for a household pet. Modern breeding practices have produced dogs that are much less aggressive but are still loyal and obedient. In spite of this, studies have shown that this breed is still more likely than others to show aggression towards people they don't know and also other dogs. 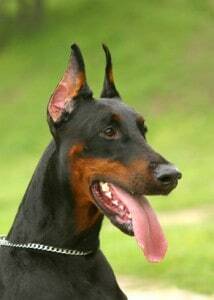 The alert Doberman Pinscher temperament makes this breed a good watchdog. It is crucial for Doberman Pinschers to be well socialized from an early age so that their natural protective tendencies do not get out of hand. It's easy to understand why a dog that was bred to work alongside their owner doesn't like being on their own. Separation anxiety can be a real problem with this breed, and they are happiest when living in close proximity to their family. If they are left alone all day while you are at work, you can expect your belongings to be chewed and your neighbors to complain about the barking. This separation anxiety is made worse if your Doberman doesn't get enough physical exercise or mental stimulation. Doberman Pinscher exercise is extremely important. These athletic and intelligent dogs need a job to do, whether it be dog sports or protection work. Don't think you can leave your dog to their own devices in the back yard, and have a happy pet. In spite of their fearsome appearance and their aggressive reputation, the Doberman Pinscher temperament is usually soft, affectionate and people loving. However, think carefully before you welcome this breed into your family, as they can be hard work to raise properly and to live with. They really are best suited to a committed owner who is well aware of what needs to be done to bring out the best in the Doberman. In general, the Doberman Pinscher tends to interact nicely with other dogs as long as they are trained and socialized from a young age. Dobies do best with other dogs of a similar size and energy level. They can be too rough and energetic for very small, delicate dogs. Make sure to introduce your Doberman to other dogs very slowly and gradually. Praise them and give them rewards for positive interactions. Likewise, Dobermans can sometimes live peacefully with cats and other small pets, but it is important to train them from a young age and always supervise them when they are together. Dobermans can make great companions for gentle, respectful children. It is important to monitor your Doberman’s interactions with children, and never leave a dog of any breed alone with small children. Due to their size, Dobermans do best with older children that cannot easily be knocked over. Although many owners will have a personal preference, there is no major difference between male and female personalities. Instead, try to let the adoption agency or breeder match you up with the right pet for your lifestyle regardless of gender. An important influence on the Doberman Pinscher temperament is breeding. Some lines tend to be shy, while others are more aggressive. In both cases, early socialization can make a big difference to your Doberman's personality, giving them the opportunity to get used to other dogs and people. It makes life easier if you choose your dog's breeder carefully and make sure you buy a pup that came from even-tempered parents. The Doberman is instinctively protective of their home and family, but they can do this job a bit too well if they aren't trained properly. It's a good idea to continue your dog's obedience training beyond puppy pre-school so that you can control his behavior when you invite friends and family to your home. This breed has consistently scored highly in obedience and intelligence tests, indicating that of all the dog temperaments, that of the Doberman is one of the smartest. This means that they are happiest when they have a job to do. Dog sports such as obedience, agility and schutzhund will give your Doberman something to do with his mind, and avoid boredom. Clever dogs with nothing to do will make their own fun, and you may not like what they do. The Doberman is still a working dog. This dog's temperament is very well suited to working alongside a security guard or police officer, or in the military. Here's a short story of the Doberman Pinscher origin: In the late 1800s in Germany, Karl Dobermann developed the Doberman Pinscher temperament for a very specific purpose. He needed a dog that would accompany him in his work as a tax collector and would protect him from robbers and bandits. Because he also ran the local dog pound, he had the opportunity to combine several breeds to produce the type of dog he wanted. For example, the strong and confident Doberman Pinscher dog shares these traits with the Rottweiler, which is thought to have contributed to their genetic makeup. The Doberman is a great breed for the right person who is prepared to meet their specific need for training and exercise, but I can't recommend them for all families. They need quite a lot of time and effort invested in them to keep them happy. The Doberman Pinscher and the German Pinscher resemble each other, but they are two distinct breeds. The German Pinscher is sometimes called the “middle Pinscher” because it is smaller than the Dobie but larger than the Miniature Pinscher. It is ideal to start training your Doberman Pinscher at a very young age. If possible, sign up for a puppy socialization class with a positive reinforcement trainer in your area. Make sure to find a trainer that uses positive, force-free methods. Never resort to a trainer that advocates rough punishment or painful training devices such as shock collars, pinch collars or choke chains. These methods are unnecessary and will erode the fragile bond between you and your dog. Dobermans are very smart and will catch on quickly to positive training methods. The intelligent Doberman Pinscher temperament makes this dog a joy to train! After you and your Doberman master the basics, you can start to explore the fun world of competitive canine sports. Dobermans are frequent competitors in agility, nosework, search and rescue, therapy work, competitive obedience, freestyle, rally obedience, and many more activities! If you are struggling with any Doberman Pinscher behavior problems, be sure to seek advice from a professional positive reinforcement dog trainer. For help with training your Doberman dog take a look at The Online Dog Trainer by Doggy Dan. Doggy Dan is an expert Dog Trainer based in New Zealand. His online resource contains Hundreds of Excellent Dog Training Videos that will take you step-by-step through the process of developing a healthy, happy well-behaved dog. Doberman Pinschers are large, imposing, powerful dogs. The average Doberman Pinscher weight is between 60 lbs (females) and 100 lbs (males). The typical Doberman Pinscher height is between 24 inches (females) and 28 inches (males). Although the classic Doberman Pinscher colors are black and tan, Dobies can actually come in a variety of colors and markings. For example, the blue Doberman Pinscher, red Doberman Pinscher, and fawn Doberman Pinscher are all varieties that are permitted by the American Kennel Club. On the other hand, the rare white Doberman Pinscher would not be permitted in the show ring. The Doberman Pinscher is an extremely low-maintenance dog in terms of grooming. Their sleek, shiny coat is easy to maintain. You will need to commit to occasional brushing and bathing. The Doberman Pinscher’s fur does not require professional grooming. You will also need to trim the nails, clean the ears, and brush your dog’s teeth on a regular basis. Your Doberman Pinscher should visit the veterinarian at least once per year for an annual checkup and vaccinations. It is also important for your Doberman Pinscher to be on a monthly flea, tick and heartworm prevention at all times. Spaying and neutering are extremely important. In fact, responsible breeders will require a spay/neuter agreement for most of their puppies. With excellent care, the average Doberman Pinscher lifespan is between 10 and 12 years. If you would like to add a Doberman Pinscher to your household, please look for a Doberman Pinscher for adoption before purchasing a Doberman Pinscher puppy from a breeder. There are already so many dogs in this country looking for loving homes. You can start your search at your local animal shelter or humane society. Dobermans and Doberman Pinscher mixes are actually fairly prevalent in animal shelters. Let the staff know that you are looking for a Dobie or a Doberman Pinscher mix. Ask to fill out an application for the future. Leave your phone number so they can contact you when Doberman Pinschers become available. You can also use Google or Facebook to search for Doberman Pinscher rescue groups. These organizations specialize in just one breed. There are dozens of Doberman Pinscher rescue groups throughout the country. You can also search for available Dobermans through Petfinder.com, Adoptapet.com and Getyourpet.com. Once you find a Doberman Pinscher for adoption, the Doberman Pinscher adoption fee will likely be between $75 and $300 depending on the organization. The adoption fee will generally include spay or neuter, vaccinations, vetting, and microchip. If you decide to look for Doberman Pinscher breeders, a good place to start is with the Doberman Pinscher Club of America. The club members can refer you to reputable breeders in your area. Never purchase a Doberman Pinscher puppy (or any kind of puppy) over the internet or from a pet store. These puppies frequently come from puppy mills and backyard breeders. Instead, ask for references, visit the breeder in person, and ask lots of questions. Ask for a tour of the property and ask to meet the breeding dogs. Make sure they have sound temperaments. Also ask to view their medical records and talk about the health of the parents. The breeder will probably ask you questions as well. They want to make sure that their Doberman Pinscher puppies go to excellent homes. They will probably ask you to sign a contract agreeing to get the puppy altered at an appropriate age and asking you to return the puppy to them if things do not work out. If the breeder denies your request for a visit and does not ask you to sign a contract, these are major red flags! Keep looking for alternative options. The Doberman Pinscher price from a quality breeder is usually between $1,500 and $2000. Conclusion- Why the Doberman Pinscher? The loyal Doberman Pinscher temperament makes this breed a wonderful pet in the right situation. In spite of their fearsome appearance and their aggressive reputation, the Doberman Pinscher temperament is usually affectionate and people loving. However, think carefully before you welcome this breed into your family, as they can be hard work to raise properly and to live with. They really are best suited to a committed owner who is well aware of what needs to be done to bring out the best in the Doberman.